The doors of Bon Von Gift Shop officially opened September 27, 2013. Elaine Fletcher, owner, had always had a dream of having a place where people felt at home and served at the same time. As she grew up she loved retail and creating with her hands. This later developed into a desire to own her very own retail shop. As Elaine was visiting her daughter in Hernando she came across the very building that would launch this dream. 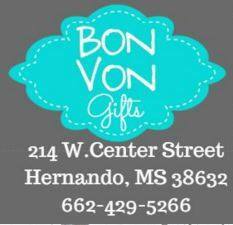 Bon Von Gift Shop is located one block East of Hernando’s beautiful courthouse on Hernando’s charming public square. The building was originally called Avon Theatre in the 40′s. The “A” on AVON burned out, so the theatre became VON Theatre. In the 1960’s Eddie Bond purchased Von Theatre and renamed it to Bon Theatre and Nightclub where many local musicians played, including Elvis and Jerry Lee Lewis. This is how the name of Elaine’s shop came to be Bon Von. While shopping at Bon Von you will find anything from candles to clothing, home décor, fudge and more. Elaine’s desire is that Bon Von would be people’s “happy place”. Overall, Bon Von is a family that prides themselves in providing customers great service and a lot of love and care. They are always ready to serve you whether that be by holding your baby while you shop, leading you to the items you are looking for, or custom designing something specifically for your home.